The history of Greece can be traced back to Stone Age hunters. Later came early farmers and the civilizations of the Minoan and Mycenaean kings. This was followed by a period of wars and invasions, known as the Dark Ages. In about 1100 BC, a people called the Dorians invaded from the north and spread down the west coast. In the period from 500-336 BC Greece was divided into small city states, each of which consisted of a city and its surrounding countryside.Basically this is how the country of Greece was formed and came to be. 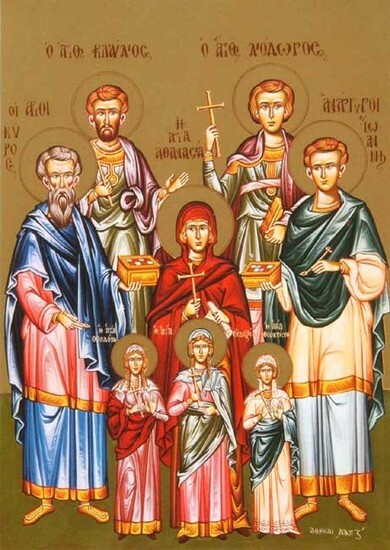 Most Greeks are named after a religious saint. A very important tradition is that everyone who has a name coming from a saint celebrated by the church celebrates his name on a given day of the year. On the "name day" of someone, his friends and family visit him without invitation and offer wishes and small presents. The hostess of the house offers pastries, sweets and hors d'oeuvres to the guests. In Greece, name days are more important than birthdays. It is a custom in Greece to get engaged before get married. The man has to ask for the hand of the woman from her father and close family, while the two families give presents to bride and groom. The couple exchanges wedding rings that are worn on the left hand. After the wedding, these rings will be worn on the right hand. In Greece, the engagement period may last for years and it is like a commitment to the families. This custom is still vivid in the Greek mainland, while gradually it tends to disappear. The ancient Greeks were a deeply religious people. They worshipped many gods whom they believed appeared in human form and yet were endowed with superhuman strength and ageless beauty. For example, Zeuss, Athena, Posedion (Olympians) and etc. This is now referred as Greek Mythology. 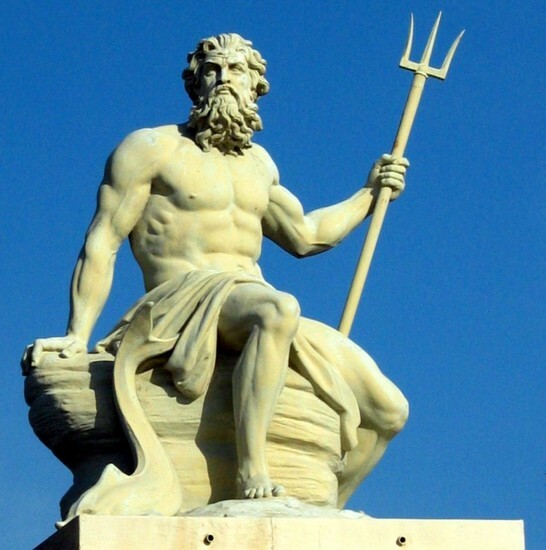 The Iliad and the Odyssey, our earliest surviving examples of Greek literature, record men's interactions with various gods and goddesses whose characters and appearances underwent little change in the centuries that followed.Most people also thought that you could control those gods and spirits through sacrifice, prayer, and living a good life. The most important spirits and gods were natural things like rain and how plants grew. If you controlled these successfully, you would have enough food, and if not, you might starve. The bride and groom stand before the altar table facing the priest. After performing all the prayers, the priest then blesses the rings and the best man places them on the right ring finger of the groom and bride. 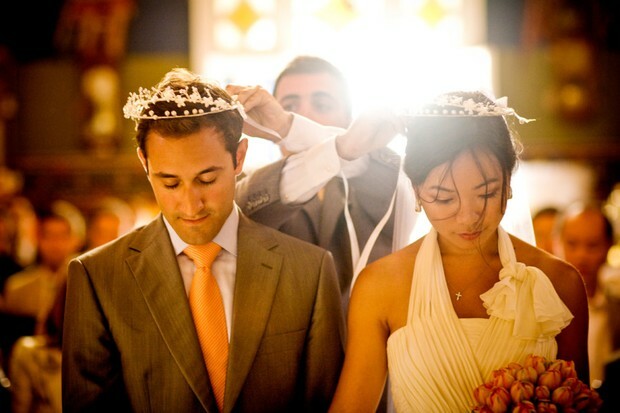 Best man is known in Greece as “Koumparos” (male) and “Koumpara” (female). He/ She exchange them three times between the couple, symbolizing that their lives are entwined forever. The priest will seal the rings on their finger by chanting a pray and placing his vestment over their crossed hands. Once the couple is crowned, Bible readings will be chant about the responsibilities and duties of marriage. The bride and groom drink red wine from the same cup and eat honey with nuts from the same spoon, which signifies that the couple is ready to share happiness and sorrow together. The red wine symbolizes the blood of Jesus Christ. Then, the priest will lead the bride and groom around the altar table three times while he is holding the Bible in his hands. In Greece it is called “The Dance of Isaiah” and symbolizes that the couple will follow the Word of God as they start a new life while the circular dance represents the eternity of a marriage, there is neither a beginning nor an end. During the “Dance of Isaiah”, the guests throw rice and rose petals to the couple to wish them a happy and long-lasting marriage. After the ceremony, it is time for a celebration! In the past, it was traditional at Greek weddings to smash and break plates. Dancing is a major component of the celebration. One of the major dances is called Kalamatianos, where the dancers come together, dancing to traditional rhythmic music. They move in a circle, holding hands, and rotate in a counter-clockwise direction. The last dance of the night is reserved for the bride and groom to do together. Guests come up to them and pin money to their clothes. 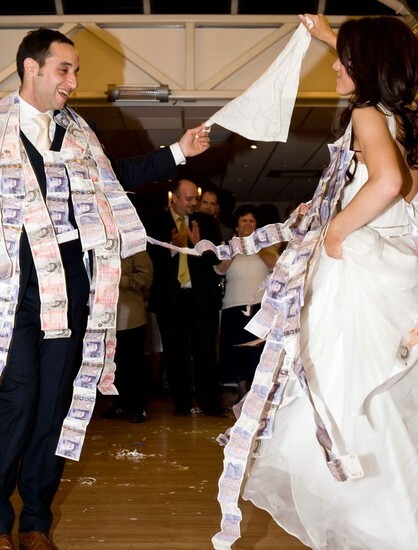 Another way for the couple to make some cash involves cutting up the groom’s tie and selling off the shreds to the guests. 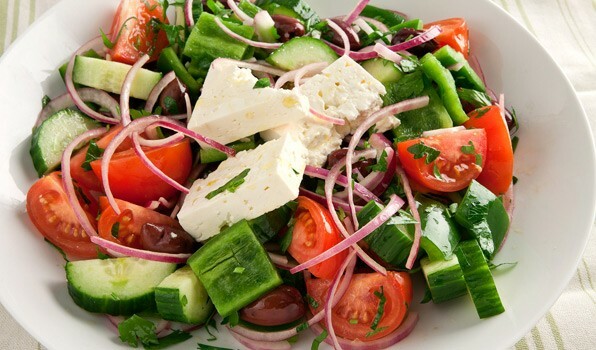 Greeks traditionally have their roots back in ancient customs and religious rituals. Greeks age always wary of the evil eye, for instance if someone compliments the brides dress without next spitting to ward off the evil eye the bride then could spill something on her dress and neglect the compliment. As far as what they can wear to ward off the evil eye is the bride can place a lump of sugar in her glove – for a sweet life- or she can walk with a gold coin in her shoe to bring prosperity. The groom on the other hand can put a piece of iron in his pocket to ward off evil spirits. During the wedding ceremonies Greek brides costumes were Hellenistic Chitons, along with the style of the dress was full, lavish draping. The Greek bride’s attire was tied with symbolism; some areas of her dress were dyed with purple which was a costly thing. Below of a females bust was a belt tied with a double knot known as either the bridal Hercules knot. The disconnection of the knot took place night of the wedding. Most importantly the sexual union of the bride and groom. The bride wore a veil that was colored yellow orange with dye form the saffron, interesting because saffron was associated with treating menstrual problems. Over her veil was a stephane today known as a “bridal crown”. Before ceremony bride was not to be seen until “anakalypteria” (unveiling of the bride). This is now used in everyday traditional North American weddings. In addition to this attire the bride and groom were crowned with laurel wreaths, these were symbolic for religion and also were intended to pay homage to the wedding of mortals. Women also wore diamonds as a reflection of flame of vow and thought of them to be teardrops of the Gods. Today we seem very similar religious practices done during marriage ceremonies. Although overtime women have become more flexible in their choices and assigned bridal gowns. One thing is for sure many of the dresses show designs that have been inspired form ancient Greek! 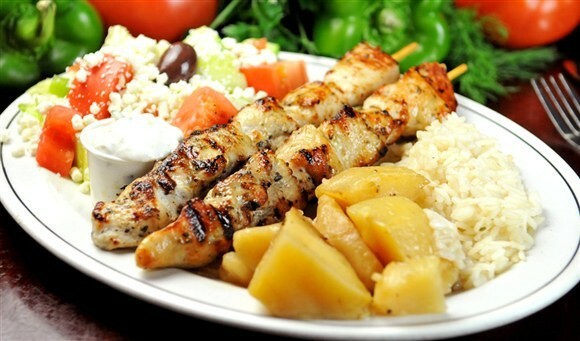 A wedding is always a celebration, and for Greeks it must include a big feast. Koufetta is a key to any wedding celebration. These are bittersweet fresh almonds - symbolizing that marriage has both good and bad in it. 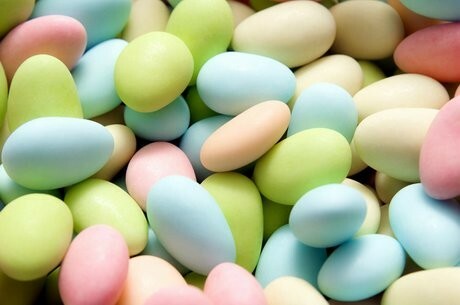 Usually the ones for weddings are coated with sugar, to hope that the couple has more good than bad! 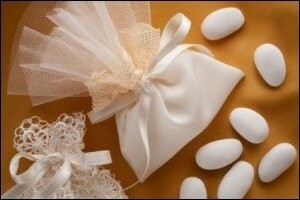 First, the wedding bed is sprinkled with these. Next, guests are given odd numbers of these in bags - odd to show that they can't be divided up evenly (i.e. that the couple is now indivisible). Unmarried women who save them to put under their pillow will dream about their own future husband. They are very popular with various decorations on them. The wedding cake itself is usually created with honey and quince. 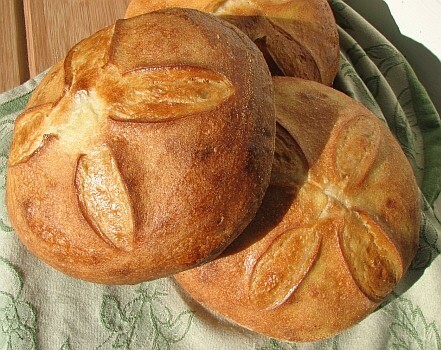 Other bread fun is often common - the bakers hide coins and even rings in the bread, and as they're eaten in pre-wedding festivities, it brings good luck. This is a very popular Greek dance performed at every wedding and everyone can participate in it. The song featured in the 1964 film Zorba the Greek and became a common wedding dance ever since. Theodorakis wrote the soundtrack, and became popular around the world. It is now commonly played and danced to in Greek tavernas. The track has been recorded by many different musicians from around the world. It is probably one of the most traditional Greek songs! This concludes our presentation. ENJOY THE FOOD!